Leonard Stephens Ltd - Bathrooms, Bedrooms, Builder, Carpenter, Kitchens based in London, Greater London. 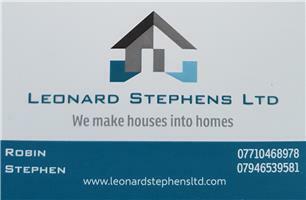 Welcome to Leonard Stephens ltd.
We are a London based company with over 38 years of experience in the building trade. From painting to extensions we provide an excellent service to all our customers and many come back to us because of our attention to detail and outstanding workmanship. Leonard Stephens Ltd is a joint company owed by Rob Rigby (38 years experience) and Steve Demetriou (20 years experience) whom have worked together for many years prior to starting up this company in 2017. They saw an opportunity to provide the best customer service and workmanship for there Clients and hit the ground running by building a 2 storey extension in there first few months of operation. What we provide as a company is simple: Good communication with all our clients throughout any project we do however large or small. Attention to detail. Reliability and a trustworthy reputation. Why should you choose us? Our company provide a proffessional, trustworthy service with competitive prices and are hands on to relieve the stress of your project.